Gary Burden decided he didn't want the usual 'album cover' with a friendly and inviting portrait of the bandmembers. Norman Steeff did this for the back cover. Instead Burden finally created a magical totemic image to represent and express the powerful dark magic of the band and the music. It represents where the band was coming from and where they were going. Burden was nominated for a grammy but did not win it. Boyd Elder did the lettering. And last but not least; Burden used one of his art pieces for the cover. The cow skull is pure cowboy, folk, the decorations are American Indian inspired and the future is represented by the more polished reflective glass beaded surfaces covering the skull. The dark, very detailed, eagle feather wings speak of mysterious powers. The skull and wings were incredibly detailed and on the original prints literally embossed. All these elemenst were set to a background of cosmic blue and black. All this together creates a magical presence of the skull, the wings and the feathers with the feeling that they stand up off the backgropund towards you. Unfortunately later pressings were no longer embossed! Flat & cheap!! 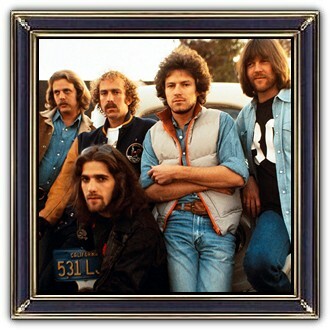 The Eagles were an American rock band formed in Los Angeles in 1971 by Glenn Frey, Don Henley, Bernie Leadon and Randy Meisner. They released their Self-titled debut album in 1972, Desperado (1973), On the Border (1974 - adding guitarist Don Felder), One of These Nights (1975), Hotel California (1976 - their commmercial peak) and The Long Run (1979). Line up changes: Joe Walsh - Bernie Leadon (Hotel California). Timothy. B. Smitt - Randy Meisner (after the Hotel California Tour). The Eagles disbanded in July 1980 but reunited in 1994 for the album Hell Freezes Over, a mix of live and new studio tracks. 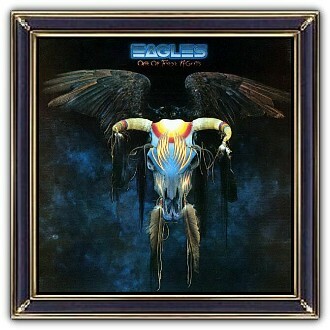 In 2007, the Eagles released Long Road Out of Eden, their first full studio album in 28 years and their sixth number one album. 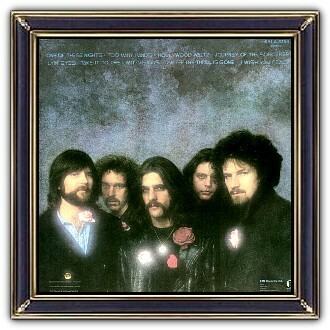 The Eagles have sold more than 150 million records world wide.